While I know that brands might just be taking advantage of the “stem cell bandwagon” nowadays, I still went right ahead and added it to my shopping cart. With one of its ingredients being Virgin Coconut Oil, which promotes hair growth and not containing SLES or SLS, which we have successfully purged our toiletries stock from for years now, and it being BFAD approved, how I can go wrong? The packaging was good. I love things in a tube, especially because the opening is at the bottom. This makes it practical for me not to have to shake the container upside down when the content is going gone. I did not miss the cheap sticker seal too, which I think earned it additional plus points. Not a lot of products have that nowadays. The product itself is unique with its mucous-y texture. I have been using this interchangeably with my Keratin treatment shampoo and conditioner. I honestly do not find a whole lot of difference. I might not repurchase. It was actually just something I thought I’d try when I found it while I was looking for welding equipment for sale for the hubby. My hair honestly even feels kinda tangled whenever I use it. 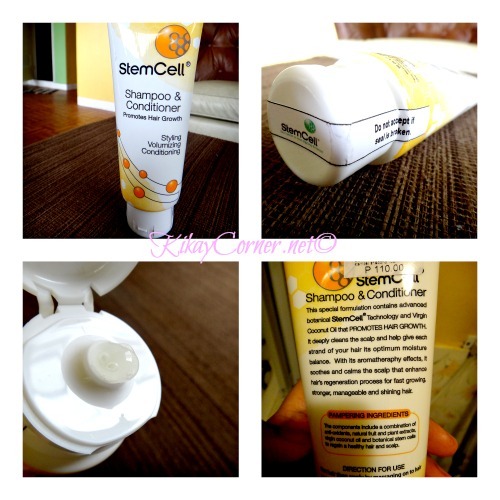 Figures why after 4 months of using it, I still haven’t finished this StemCell Shampoo and Conditioner tube.